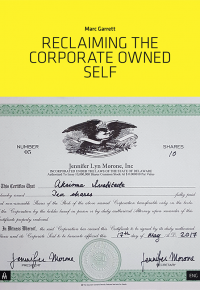 The American born artist Jennifer Lyn Morone registered herself as a corporation in 2014, founding Jennifer Lyn Morone™ Inc. As the founder, CEO, owner, shareholder and product of her own company, she sells, leases, rents or invests her personal data for her own profit. She has commercialised her hormones and diamonds made from her hair, advertising them through satirical videos. In the Netopticon, the panopticon in which we live using platforms such as Facebook and Google, our data are vacuumed up to generate profits in an extreme form of capitalism. Artist and curator Marc Garrett (www.furtherfield.org) says that Jennifer Lyn Morone’s project turns the tables by shining the torch back onto the data hunters to study their behaviours and clarify the conditions of the data hunt, a dystopian act of genuine survival similar to what punks did when they picked up their instruments to forge a new era of social change, where outsiders found a voice for free expression. The American born artist Jennifer Lyn Morone registered herself as a corporation in 2014, founding Jennifer Lyn Morone™ Inc. As the founder, CEO, owner, shareholder and product of her own company, she sells, leases, rents or invests her personal data for her own profit. She has commercialised her hormones and diamonds made from her hair, advertising them through satirical videos.